This checklist serves as a template for a Service Level Agreement (SLA), and an Operational Level Agreement (OLA). Service Level Agreement (SLA) - an agreement between an IT service provider and a customer. Operational Level Agreement (OLA) - an agreement between an IT service provider and another part of the same organization, governing the delivery of a infrastructure service. 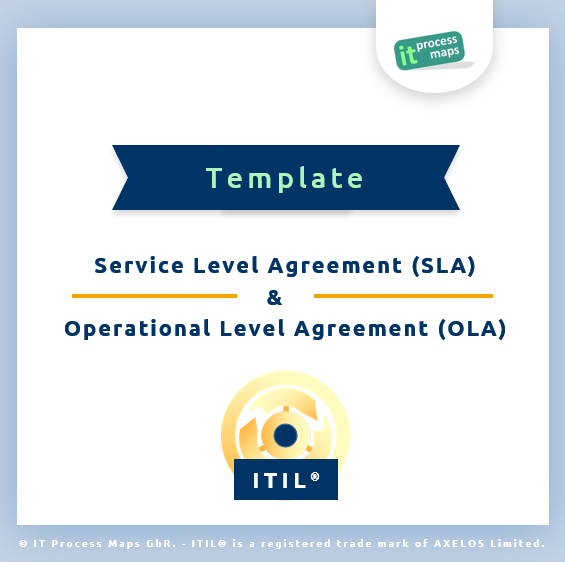 The following statements on Service Level Agreements are therefore equally applicable to OLAs, with one important point to consider: When agreeing an SLA, the Service Provider acts as a provider of services to the business; in the case of an OLA, the agreement is between two parties within the service provider organization. The Service Level Agreement extends the service definition from the Service Catalogue, defining detailed service level targets, mutual responsibilities, and other requirements specific to a service provided for a certain (group of) customer(s). It focuses on the definition of requirements from a customer viewpoint. The SLA document evolves from the Service Level Requirements during the Service Design process. Required capacity (lower/upper limit) for the service, e.g.